If a golf professional plays in a major that the No. 1 ranked player is sitting out, and the NBA Finals and NHL Stanley Cup Final draw a respective audience, is there anyone there to witness the golf tournament on television? 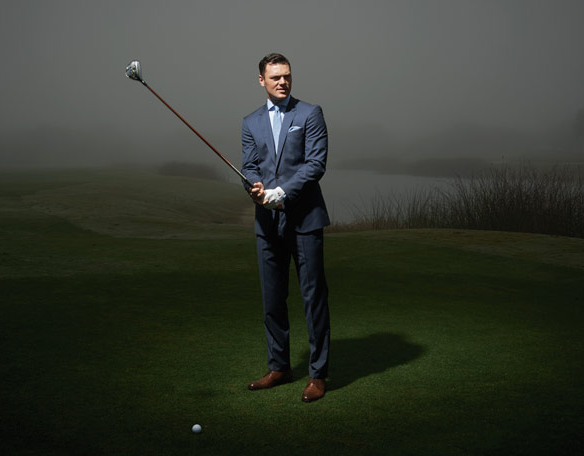 Martin Kaymer set the 36-hole scoring record by opening with a pair of 65s at the 2014 U.S. Open at Pinehurst, NC. He never let anyone closer than four shots over the final 48 holes. He was the only player from the last eight groups to break par and easily won the U.S. Open for his second career major. Kaymer closed with a 1-under 69 for an eight-shot victory over Rickie Fowler and two-time heart transplant recipient Erik Compton. The 29-year-old German is only the seventh player to go wire-to-wire in the 114 years of the U.S. Open. “You want to win majors in your career, but if you can win one more, it means so much more,” Kaymer said. Only a late bogey kept Kaymer from joining Tiger Woods and Rory McIlroy as the only players to finish a U.S. Open double digits under par. These are professionals but Kaymer separated himself amongst them. Kaymer won the U.S. Open by shooting a 9-under 271, the second-lowest 72-hole total in U.S. Open history and the third-most strokes under par in event history. “No one was catching Kaymer this week,” Compton said. “I was playing for second. I think we all were playing for second.” Tiger Woods still holds the most dominant U.S. Open win by 15 shots at Pebble Beach in 2000. McIlroy holds the scoring record at 16-under 268. This is the type of play expected from Tiger Woods. Would it have garnered more television viewing if his name was atop the leaderboard? Yes.